Phishing is the most commonly used method to hack Facebook. The most widely used technique in phishing is the use of Fake Login Pages, also known as spoofed pages. These fake login pages resemble the original login pages of sites likeYahoo , Gmail, MySpace etc. The victim is fooled to believe the fake facebook page to be the real one and enter his/her password. But once the user attempts to login through these pages, his/her facebook login details are stolen away. Howeverphishing requires specialized knowledge and high level skills to implement. So I recommend the use of Phishing to hack facebook account since it is the easiest one. Note:'http://www.google.com.pk' is the redirection url,When victim will enter his/her email and password he will redirected to'http://www.google.com.pk' instead of "http://rafayhackingarticles.blogspot.com"
7.Go to http://yoursite.110mb.com/Facebookpassword.htm for the stored passwords ! Cheers ! you can leave your comments if you have lost your way ! SniperSpy is the industry leading Remote password hacking software combined with the Remote Install and Remote Viewing feature. Once installed on the remote PC(s) you wish, you only need to login to your own personal SniperSpy account to view activity logs of the remote PC’s! This means that you can view logs of the remote PC’s from anywhere in the world as long as you have internet access! Do you want to Spy on a Remote PC? Expose the truth behind the lies! Unlike the rest, SniperSpy allows you to remotely spy any PC like a television! Watch what happens on the screen LIVE! The only remote PC spy software with a SECURE control panel! This Remote PC Spy software also saves screenshots along with text logs of chats, websites, keystrokes in any language and more. Remotely view everything your child, employee or anyone does while they use your distant PC. Includes LIVE admin and control commands. 2. After downloading winspy keylogger to hack Facebook account password, run the application. On running, a dialog box will be prompted. Now, create an user-id and password on first run and hit apply password. Remember this password as it is required each time you start Winspy and even while uninstalling. 3. 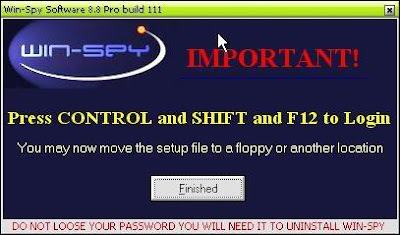 Now, another box will come, explaining you the hot keys(Ctrl + Shift + F12) to start the Winspy keylogger software. 4. Now, on pressing hot keys, a login box will come asking userid and password. Enter them and click OK.
6. Select Remote at top, then Remote install. 7. On doing this, you will get a popup box as shown in image. Now, fill in the following information in this box. .file name - Name the file to be sent. Use the name such that victim will love to accept it. .picture - select the picture you want to apply to the keylogger. Thats it. This much is enough. If you want, can change other settings also. 8. After you have completed changing settings, click on “Create Remote file”. Now just add your picture to a winrar archive. Now, what you have to do is only send this keylog file to your victim. When victim will open this file, all keystrokes typed by victim will be sent to your email inbox. Thus, you will get all hispasswords and thus will be able to hack his email accounts and even Facebook account password.